Radikal Records, one of the United States’ leading independent electronic dance music record labels, has released the self-titled debut album from emerging Brighton UK electronic artist Salt Ashes, today, Friday, July 15th. 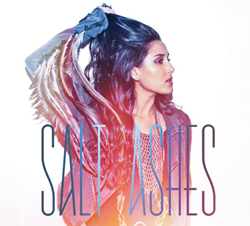 Fast rising UK electronic singer-songwriter Salt Ashes celebrates the release of her eponymous debut album, “Salt Ashes”, which is available today on Radikal Records. The album stays true to the young songstress’ signature dark Pop songs and has a zeitgeist club sound, which she has become known for since bursting onto the music scene a little over three years ago. Salt Ashes, aka Veiga Sanchez, signed with Radikal Records in early 2014 who initially released her singles “Somebody” and “If You Let Me Go,” a Top 5 record on both the Billboard and Music Week Dance Charts. She continued to build on her unique spectral synth-pop sound in 2015 with the release of her single “Raided,” a BBC Introducing and Spotify Fan favorite. All three of Salt Ashes previously released singles can be found on her debut album. The album’s extraordinary lead in single “Save It,” co-written with Rob Irving (House of Emeralds), received strong pre-release buzz from the UK’s discovery site Record of the Day (“now comes this brilliant on-trend banger with one hell of a chorus and everything required to be an instant worldwide smash. Calvin Harris would probably kill for this tune”) and US tastemakers Idolator (“Salt Ashes has whipped up a firecracker with her new single”). Her song “Whatever You Want Me To Be”, an intimate, dynamic electronic track made it’s debut on renowned entertainment outlet WhoSay in late June and is guaranteed to be a fan favorite. The slow build-up and sultry voice in the track shows the ever-growing diversity and range of Salt Ashes sound. The album takes listeners on a journey through love, loss, heartbreak, finding and losing yourself. When asked to describe her debut album, Salt Ashes stated “The songs are like a magnifying glass into the past 5 years of my life, so I’m hoping people will get to know me and my mind a little better.” Drawing influences from Depeche Mode, Giorgio Moroder and AlunaGeorge, the debut album establishes Salt Ashes an exciting artist to watch in the electronic music scene in 2016 and in the future. “Salt Ashes” is now available for purchase in record stores nationwide, on Amazon, iTunes, Bandcamp, Google Play, and in the Radikal Records web-store. It is also available for streaming on Spotify.